Looking for a hobby that can be as relaxing or challenging as you want it to be? Need something to get the kids off the couch and into the great outdoors? A radio control vehicle (R/C) may be just the ticket! 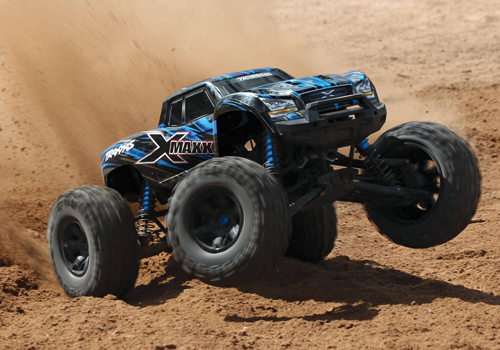 Wondering what separates toy remote control cars and trucks from true hobby-class vehicles? There are many factors, including quality, durability, and repairability, but the biggest difference is speed! Most toy R/C vehicles top out around 8 - 10 miles per hour (MPH), while some of the least expensive hobby-class cars can travel 20 - 30 MPH. Advanced nitro-powered or brushless electric trucks can often hit speeds of 60 - 70 MPH or more! Hub City Hobby has South Mississippi's best selection of hobby-class radio control vehicles, plus batteries and battery chargers, nitro fuel, glow plugs, wheels and tires, and repair parts for most major brands. Choosing your first R/C car? We have value-priced entry-level electrics from Dromida and ECX starting below $100! Ready to step up to something more advanced? Hub City Hobby carries race-quality trucks from brands like Team Losi and Traxxas, Axial rock crawlers and rock racers, and street cars from Vaterra, plus everything you'll need to hop up your current R/C ride, including brushless power systems, lithium polymer (LiPo) batteries, and upgraded radio equipment. If you'd rather have fun in the air, you're not alone! Multi-rotor aircraft, or drones, are the hottest thing in remote control right now, while R/C planes and helicopters are still very popular. Thanks to today's advanced flight systems, which range from simple stabilization assistance to integrated GPS technology, it's never been easier to learn to fly! If you already know the basics, Hub City Hobby also has what you need to transition from a beginner aircraft to a true aerobatic machine or a powerful aerial photography platform. If you're not sure where to start, we stock the Pine Belt's best selection of beginner aircraft, from fun indoor quadcopters suitable for younger pilots up to sophisticated trainer planes with built-in GPS and the ability to land themselves! As your skill increases, move up to an intermediate or advanced aircraft from leading manufacturers such as Blade, E-flite, Great Planes, Hangar 9, ParkZone, or SIG. Whether you want a 3D helicopter, a stunning scale warbird, or a drone with a 4K video camera, Hub City Hobby can help! Enjoy building or need to repair your current plane? Don't worry! We've got plenty of parts and supplies, including cyano-acrylate and epoxy glues, props, batteries, balsa wood, heat shrink coating, servos, and much, much more. Land and air aren't the only place to have fun with radio control! From budget-friendly beginner craft to brushless electric race machines, Hub City Hobby has what you need to hit the water in style! Whether it's a relaxing sailboat, versatile airboat, or an insanely fast deep-V or catamaran, we've got a boat for you from great brands like Aquacraft, ProBoat, and Traxxas! Remember, if you're ready to stop playing with toys and experience "real" radio control excitement, Hub City Hobby is South Mississippi's source for R/C!